Cyfuture, India's leading Enterprise and Business Solutions Provider has been awarded with prestigious "Rajasthan State Award for Export Excellence" by His Excellency Mr. Ashok Gehlot, Chief Minister, Rajasthan. 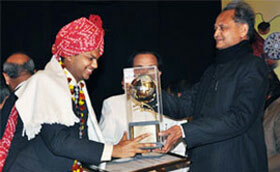 The award was presented to Mr. Anuj Bairathi, CEO and President of Cyfuture. Rajasthan State Award for Export Excellence is an annual award which is presented to those outstanding companies which deliver consistent results and outperform their competitors by delivering world class service. 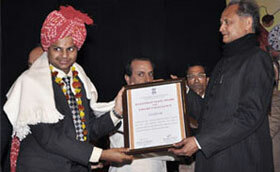 This award is given by the Government of Rajasthan, Department of Industries for the best export performance. The rigid selection procedure is purely based on exceptional performance and service standard. As Cyfuture has once again bagged a prestigious award from the Government, it is clearly evident that the company is highly focused and committed in becoming the market leader in its domain, and is leaving no stone unturned to achieve maximum productivity with superior customer service.